When I did my very first Reader Survey last year, the results revealed that the primary age bracket of SavingsPinay Readers are in between 25-55. I remember how surprised I was back then. I felt a lot of pressure because I knew those who are reading this blog have the age and experience advantage that I cannot contest. And to give thanks for the trust that you are showering for about a year now in my blog, I thought of creating this post. This is actually a product of observations and of research. I may have zero knowledge on what life is when you are in your 30s, 40s and/or 50s but what I definitely believe is that “Money matters affects us no matter what age we belong with“. It is a primary reason of our stress in life. We feel mentally, emotionally, physically and socially depressed because of money. 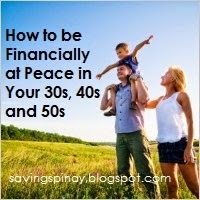 So no matter what age you belong, this blog post will empower you to find the peace and security that you long for financially. Now, for the next 10-15 minutes write down all of your Financial Issues. What are the things or items that make you stressed?! The very items that continually absorb all your energy because you just can’t stop thinking about them. Again all that concerns your finances. Personal Debt. Utang sa kamag-anak, kakilala at sa Five-Six at sa kung kani kanino pa.
Credit Card Debt. There will be monthly envelope from the bank informing you of how much you owe and the consequences of your inability to pay. Car loans, House Loans, Insurance and the like. Monthly fees you owe out of investing in something that you really wanted. Kid’s Future. From the allowance, tuition fee and miscellaneous fees. Zero Savings. All the money that you’ve worked hard for over the past is now gone. Casual arguments over money with your spouse. When a couple argues about money, it is sad and depressing not just for the couple but for those people surrounding them. Meralco, PLDT, Nawasa and the like. The inevitable monthly bills you sadly miss to pay. Now that you have identified your Financial Issues you are now ready to Take the Next Action. In every Financial Issue that you are experiencing think of the actionable items you can do in order to cross out the matter. What Your Next Actions Can Be?! Talk to the person/s that you have personal debt with and negotiate with them. Try to talk with them sincerely on why you can’t pay for now. Explain your side and together come up with a date that will be agreeable for both parties. Make sure to have a written contract even just the back of a simple paper. Prioritize debts that have the highest interest rate. Once the pay check arrived make sure to set an amount for your credit card debts. Cut the Credit Card in half or just literally freeze it on the fridge so that you won’t enable yourself to spend more. Slowly build your savings. Try to save even just a little so that you will have extra money for emergency purposes. Automate the things that you could automate. I applied for online banking both to my personal bank account BPI and my payroll account in Metrobank. I used the online banking feature to automate my payments. My FAMI is being paid on a monthly basis through Metrobank Online while my gifts for church missionaries are automatically deducted on my BPI. Every time the bills arrives, secure an amount to pay them. You can also try to do money saving techniques like water conservation as well as managing your electrical consumption. Be insured. Though insurance depends highly on age, you are never too old to be secured. Talk to your financial advisor and learn more about life insurance and how this could maximize your potential in life. Both my parents applied for St. Peter Plan in their 50s and now they are done paying. Now my goal is for them to have a memorial lot. Make it a habit to examine your finances. How much is your asset and compare it to the total of your liabilities. Make sure that you also assess your goals and plans in life. A good 10-15 minutes a day is not bad to just meditate over your money issues and resolve them by thinking of the next best action to do. Do not try solving the money problem alone. If you have your spouse then talk to him/her. It is the right of your partner to know what you’re dealing with. Should you tell your kids?! Well, growing up my parents never ever gave us the impression that they are having difficulty in terms of finances. We, as siblings, were always the last to know. But now that all of us were grown up already (except the youngest) we wanted to change that culture in the family. The main thing is that “dapat may nahihingahan ka”. You need someone to advise you on what to do. You need emotional and physical reassurance that everything will be ok in God’s time. Your age is your greatest advantage. It is never too late to make financial plans in life. Be at peace by identifying first and foremost what causes the dilemma and creating the next action plan. I remember a quote I once heard during my high school years, “Peace is not the absence of war but the presence of God”. Here will be issues and problems along the way but always have firm grip with your soul. Know that God’s wants us to prosper in life. In all ages, I think trying hard to be debt free is a must. Also, discipline and self control is an important factor in saving. You are also right about getting insurance. It is not very common to get ensured, but it is important to avoid the burden having to pay large amount of expenses in the future. Since it not very common, people does not know where to start and how to begin. As you have mentioned, it best to turn to financial advisor for this matter. In addition, they can also get information online and get insurance quotes, this way people will havean idiea how much insurance costs from different companies. Hello po! A big thanks for reading this post. Masaya po ako na nagustuhan niyo yung blog post na ito. Hope you can share the info with others. Have a blessed day ahead. Hello there! Thanks for sharing your valuable thoughts! Truly, insurance should be taught more to Filipinos since there is still a big portion that doesn't believe in that it will be a worthy investment.